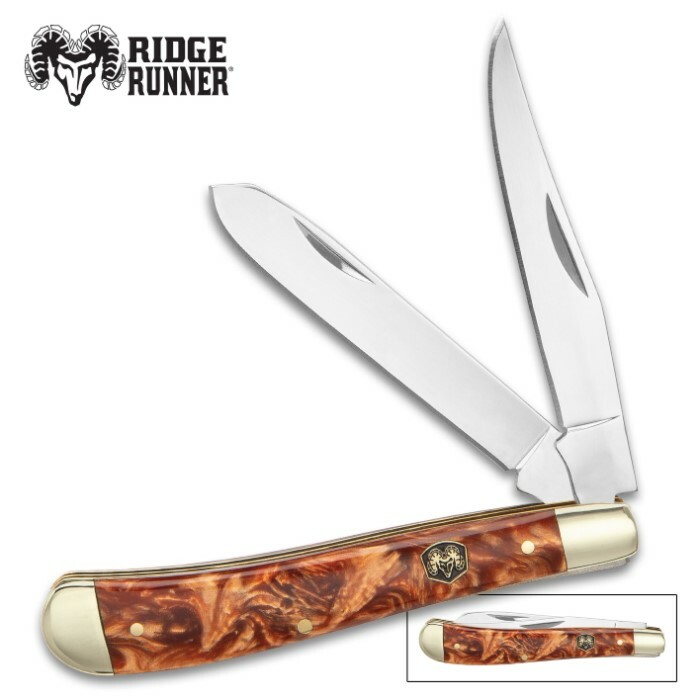 Ridge Runner Amberwaves Trapper Traditional Pocket Knife / Folder - 420 Stainless Steel - Fuzion Handle, Iridescent Amber Burlwood Patterning - Everyday Carry / Collectible - 4 1/8" Closed | BUDK.com - Knives & Swords At The Lowest Prices! 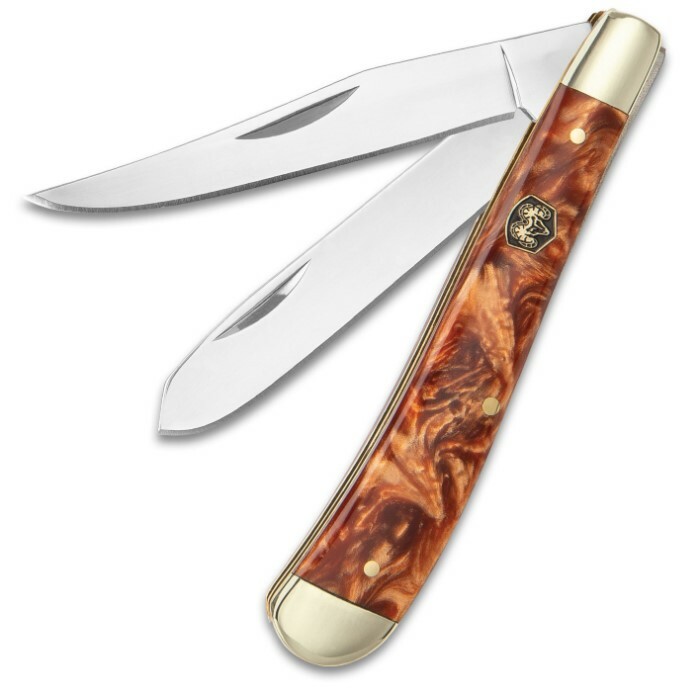 Ridge Runner's “Amberwaves” Trapper works hard and looks great doing it, infusing any knife collection with elegance and eye-catching allure. The subtle detail in the Fuzion handle is extraordinary - swirling with shades of copper, tawny, caramel and - of course - amber. 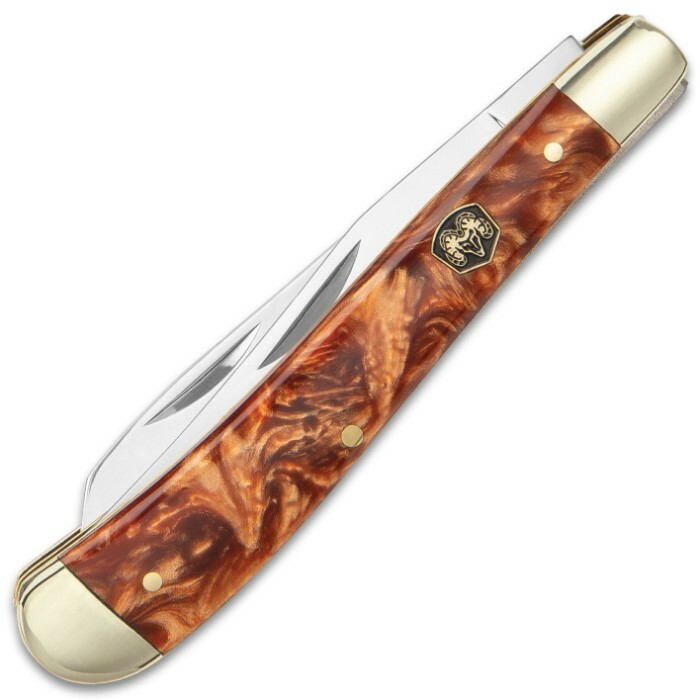 Undeniably unique, the intricate patterning evokes fine burlwood bathed in an opalescent glow. When rotated under light, the handle glints and glistens as if infused with gold dust. The state-of-the-art Fuzion also resists chipping, scratching and other damage, while the smooth, polished texture creates a bond with your hand that’s simply unrivaled. And since it’s a Ridge Runner, you know you’re getting blades with sharpness and durability second to none. 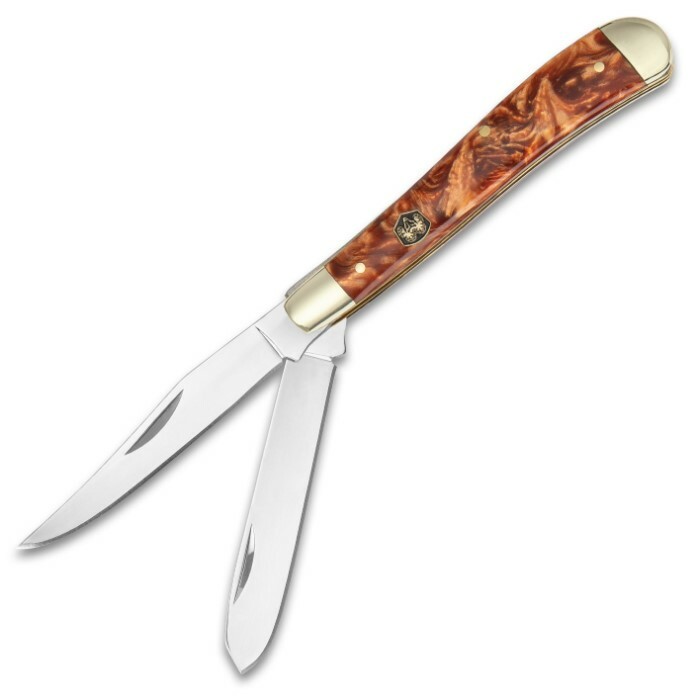 Perfectly sized for everyday jobs and then some, the 4 1/8" (closed) Amberwaves Trapper features a remarkably versatile blade duo: a clip point and spey blade. Both are flawlessly cast from resilient 420 stainless steel and carefully honed to a razor sharp edge. No doubt about it - Ridge Runner’s Amberwaves Trapper is built for a lifetime of enjoyment and won’t let you down when the going gets tough.